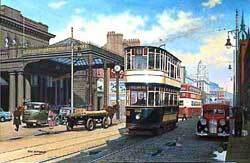 In this 1952 scene a 'Rebuild' tram No. 252 is leaving the city en route for Malone Road. Parked outside the terminus station on the Great Northern Railway are horse drawn and Scammell vehicles of the Ulster Transport Authority. This magnificent building was demolished in the late 1960's to make way for the Europa Hotel. The Belfasttramway system ended in Febuary 1954.